The Bankers who shape the world. 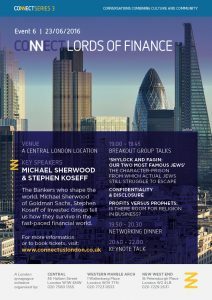 Michael Sherwood of Goldman Sachs, Stephen Koseff of Investec Group tell us how they survive in the fast-paced financial world. PROFITS VERSUS PROPHETS: IS THERE ROOM FOR RELIGION IN BUSINESS?